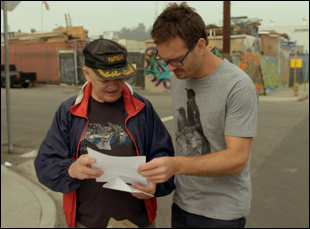 It was a pleasure to talk to David Farrier, if for no other reason to learn he was still alive and well. After messing about in the bowels of YouTube for his day job reporting on the odd and obscure in addition to his regular pop culture beat for the TV news in his native New Zealand, Farrier came across what he was sure would be his next story when he stumbled upon a video of “Competitive Endurance Tickling,” a surprisingly rigorous and aggressive take on the usually silly activity. However, when he inquired with Jane O’Brien Media, the company behind the video he saw — and as it would turn out, thousands of others since the 1990s — he was surprised to receive a disproportionately nasty reply from a representative of the company, who threatened legal action if Farrier were to pursue a story and went one step further to send three other representatives of the company to dissuade him from going any further. Naturally, this piqued Farrier’s interest even more and what might’ve been originally envisioned as a minute-long news segment soon became a 90-minute feature called “Tickled,” which is hardly the frivolous, playful comedy its title implies. While being absurdly funny as Farrier and co-director Dylan Reeve get drawn into the surprisingly nefarious world of tickling fetish videos, they discover in their search to unmask those behind the secretive Jane O’Brien Media an extremely disturbing and occasionally heartbreaking trail of young men lured to Los Angeles with the promise of $1500 and a four-night stay in a fancy hotel, only to have their lives summarily destroyed first by the posting of the one or two tickling videos they’d make in exchange and then even more aggressive harassment than Farrier experienced himself when they didn’t want to make another. Eventually, a story involving millions of dollars, the FBI and loads of litigation, the tickling ultimately becomes the least bizarre and intriguing element of what the first-time filmmakers uncover. Since finishing filming on “Tickled,” Farrier and Reeve created a shroud of secrecy around the production that only lifted when the film premiered earlier this year at Sundance, where Farrier made a point of looking into the crowd during the Q & A to see if there were Jane O’Brien spies in the audience. Yet with the protections that only a public rollout can provide, Farrier doesn’t seem all that concerned these days with any further legal threats regarding “Tickled” and in advance of the film’s regional premiere at the Seattle Film Festival en route to a national release in June, he spoke about finding the unbelievable true story and bringing it to the screen in nail biting fashion, as well as the frightening prospect of getting tickled himself and the tricky task of reviving online video from the ‘90s. Since you hadn’t made a feature before, when did you know this was the form this story might take? There are a few moments when I thought it might be a good time to start making a film. The first was when I got a letter from a lawyer basically saying, “Stop writing about this, stop doing what you’re doing.” When anyone tells you not to do something, you kind of want to do it more. When I really thought I really needed to pick up camera and just start filming was when the Jane O’Brien media company sent three representatives from New York all the way, business class, to New Zealand. I thought, “If they’re going to fly people all this way, I’ve got something I can actually film [because] it’s taking the jump from being this thing online thing to a real life thing. Also, they’ve clearly got money, so there must be more to it. It’s condensed in the film, but if Kevin, a member of that contingent doesn’t get mad at you for filming him at the airport, what was even supposed to happen at that meeting in New Zealand? They don’t have any legal authority. They’re just the guys that shoot the videos. One of the things that I really appreciated too were these beautiful establishing shots you have in each location you go to. Was that something you had to figure out? Dylan and I talked a lot with our [cinematographer] Dom Fryer because we wanted each city to almost be a character unto itself. In the film, we travel around a lot – we go to Muskegon in Michigan, at one point, which is cold and freezing, and to LA, New York, Florida. We wanted each of these places to have a certain look, and that was Dom. We didn’t ever think we’d have a feature film. When we started this, it was a Kickstarter project, and we thought it would be a half-hour doco on Vimeo or something, but we saw the scope of the story and just wanted to visually things to reflect that. Because we get those glimpses of the types of news stories you do at the start of the film – typically more lighthearted fare – when this story turns dark, was it an adjustment for you? Totally, but I love dark stuff. I do very light-hearted stories and I think people think I’m a really light-hearted guy, but I love diving into super-dark territory and that’s just never been reflected in the stories I’ve done. In my newsroom, I’ve always worked in entertainment, but I worked alongside a lot of current affairs journalists, and I’ve always admired just watching them take the time to dive into a story. I felt with Dylan, this was my chance to really dig in, and as much as this is about tickling, I think it’s about power and control and manipulation, all topics I find really interesting. I don’t know if enjoyable’s the right word, but I liked getting stuck into it. I’m glad I did it. It’s different to interviewing Justin Bieber, put it that way. Because I cover movies, I can just imagine being plunged into a murder investigation would be a totally different experience. [laughs] The thing is you won’t see it coming. It will just suddenly happen. Was there a moment where you felt like you were in over your head? There were certain moments where Dylan and I or Dom would stake out a location and then we’d go and confront people that was, I found, new territory. When I met Richard Ivey, a tickling fetishist in Florida, I’d talked to him [first] on the Internet, and he said, “If you’re going to interview me about tickling, I’m going to tickle you first.” On the email, I was like, “Oh, hahaha. Sure thing.” But then when I arrived at his house, he was basically like, “Okay, I’m going to strap you into this chair and tickle you.” So there’s a scene in the film where Richard is tickling a guy and I was in that same chair. He tickled me nonstop for ten minutes. He’s a professional tickler and when you’re fully locked in and it’s with this person you’ve never met, you can’t get out and he’s tickling you, that was terrifying. You show up to that interview wearing a flamboyant, tie-dyed Orlando t-shirt. How did you wind up in that? I love bright t-shirts, and the night before, I was in this tacky tourist store where you can get gator claws and all that. They had this terrible tie-dye Florida shirt. I was like, “Yeah, I’ll buy that,” but for some reason, when I woke up that morning to do the shoot, I was like, “I might as well just wear it.” Worst shirt ever. At a certain point in the film, I wondered what the release process for a film like this was. There are a few faces blurred, but by and large, people must’ve given their consent to appear. A lot of the tickling videos that you saw we didn’t need release forms for all because they exist on the Internet, but there are a lot of the historic clips, which are now not online anymore, that if we didn’t get permission, we had to blur. We met a lot of people in the videos, and they were like, “Oh no, it’s fine.” One guy we met, we had this clip of him being tickled from the late ’90s and he was like, “No, just use it, it’s fine” and we ended up interviewing him. Because we were dealing with such a litigious subject, we had to be super careful. Every number plate in the film was blurred, and we did it in a super subtle way. It was a long process to go through, but certain videos and certain people we couldn’t identify, certain people we could. Did you actually have to fire up a RealPlayer from the ’90s to show those early online videos? Was it interesting to compare notes with the other two journalists you feature in the film who went so far down their own paths with this tickling empire? Yeah, and she leans forward. The whole theater laughs at that point because they’re just so onside with her. Those are the moments you want to try and capture – people reacting in real time to things and revelations – and I was really proud we were able to capture that. It was this wonderful back and forth. Then Hal [Karp] was great because he was doing exactly what Dylan and I were doing, but a decade ago, so meeting them was amazing. They’re journalists, so they’re naturally curious about things and they’re asking all the right questions. Without them, we wouldn’t have a film. Since you’ve done so many different kinds of storytelling – as a newscaster, as a podcaster -was filmmaking interesting to you as a form? Having 90 minutes to tell a story was great because it made us work really hard to justify it. If people are going to sit down in a theater for 90 minutes, you’ve got to make something that is worthy of their time, so it was a challenge to make sure it lived up to those expectations. But it’s just a fun way to tell a story. I’m used to telling stories in one-and-a-half minutes on the news, and you’ve got to get straight in there, whereas with a feature, you can let things breathe. Simon Coldrick, our editor, did an amazing job because there’s these bits in the film where it is just calm mixed in with all the crazy – these moments of just music and reflection that you couldn’t do in a TV program in New Zealand, whereas in film, you can. After you finished filming, you’ve said you more or less went silent. Was this a relief to premiere and get out in the world? It feels good to finally have this out because after we completed shooting, we didn’t want to get any more legal threats, so we went really quiet. We didn’t update our Kickstarter backers. We didn’t talk about it. We wanted the company it’s about to think we had stopped, and faded away. To actually be able to talk about it and show it to audiences has been a total blast because you want to make something, but you want people to see it as well, so getting it out there is a dream come true. “Tickled” will play at the Seattle International Film Festival on May 24th at the SIFF Cinema Uptown at 9 pm. It will open in theaters on June 17th. A full schedule of cities and dates is here. SIFF '16 Interview: Spencer Haywood on Pressing On for "Full Court"
SIFF '16 Review: Bill & Turner Ross Reinvent the Concert Film in "Contemporary Color"